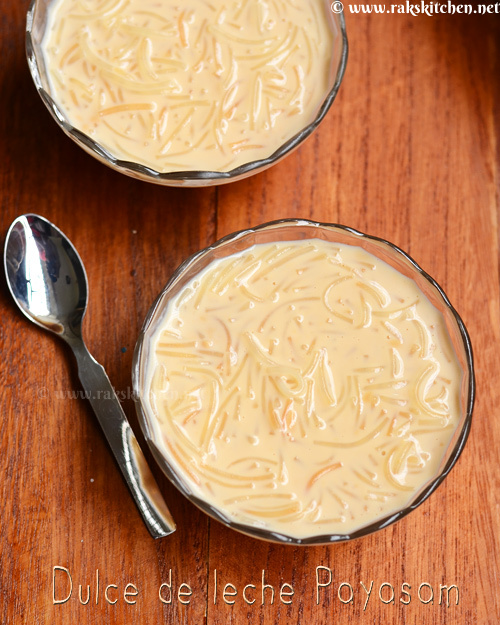 Semiya payasam with dulce de leche. 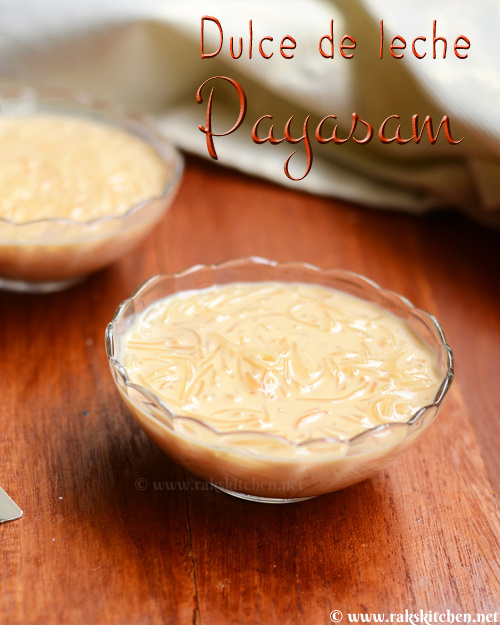 Rich, creamy and caramel flavoured payasam. Simple and easy to prepare but very delicious payasam. Dulce de leche is made by cooking sweetened condensed milk for long time which ends in caramel flavoured thicker creamy end product. I have tried this before, once and loved it. had as such. 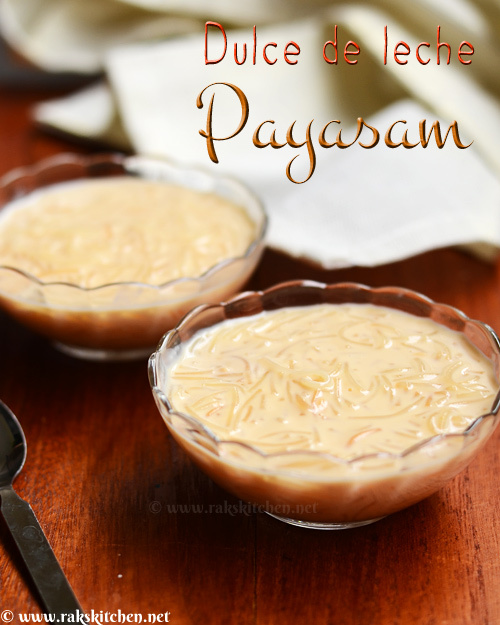 Wanted to try payasam with it and thought of making it for New year post too. So got two cans of condensed milk. Tried a method of making dulce de leche in microwave oven. But somehow could not get the same even effect of the dulce de leche made in the pressure cooker method. So made in pressure cooker method itself referring Divya Kudua’s Easycooking blog. Payasam made with Dulce de leche was really rich and delicious. Place condensed milk tin in a pressure cooked filled with half cooker water. When first whistle comes, keep the flame in low and continue cooking for 40 mins. Let it cool down and open the tin for dulce de leche. In a heavy bottomed vessel, heat ghee and roast vermicelli in low flame until golden. Add water and cook until soft. Pour in milk. In goes 1/2 cup of prepared dulce de leche. Mix well to dissolve it. Add sugar and adjust water if needed and bring to boil. Once simmered for 2 mins, switch off the flame. You can add powdered cardamom and cashew nut fried in ghee too. Once cooled, it gets slightly thicker, so adjust milk or water as needed. Add water and cook until soft. Pour in milk. Add 1/2 cup of prepared dulce de leche. Mix well to dissolve it. Add sugar and adjust water if needed and bring to boil. Once simmered for 2 mins, switch off the flame. Serve cold or warm as needed. Sounds will be delicious. Have a tin of milkmaid handy now but hv opened and stored in a stainless steel dubba for easy usage. How can i use this to prepare the above? Any idea?.. Wow…this looks interesting. Will have to give this a try. Wow, anything with DDL is a sure shot winner! I'm sure this payasam was delicious! Quick question – IS it safe to cook the tin? Is it meant to be used like that? sorry about another question. Do you think I can put two tins in the cooker at a time instead of doing them separately? Thanks for responding. I am going to try this for a poutluck for 75. /can you tell me how much dulce de leche does the tin yield. I see you used only 1/2 cup for your 2/5 cups of liquid. Trying to determine how much I would need. TIA!